First off, I want to apologize for the poor lighting and use of an iPhone 4S to shoot the picture with. Depending on whether you guys actually read this thing, will decide my motivation for spending money (I don’t necessarily have) to purchase a camera. DTF? Yep, that’s what I said… Down-Town Fullerton. Transformed from a city of an agricultural mindset, to one of bars and clubs… Fullerton, after establishing a Cal-State University, started to rack up population numbers and grow rapidly in 1957. Here’s a tip: When trying to get a table… Look for the man in the hat! Luckily for me, there were people already waiting inside, who directed me towards this seating-wizard. If it hadn’t been for them, I would have had no clue how to get a table, being that there was no line, no host podium, and no other direction. I literally had to walk across the restaurant, flag down the hat-guy, and have him write my name down. Not the best first impression if I do say so myself; however, I guess that’s the risk you run when going to a “BAR and grill”. After a 20-minute wait, we were seated. They use an almost picnic-style table, with blue-checkered tablecloth and padded seats with backs. The ambience was one that you would expect from a bar, blasting Van Halen and other “classic rock”. We gave our orders, and the food followed pretty quickly there after. By that time, were we ready to devour it. I took the normal 3-minutes taking pictures and checking presentation before I gathered myself for the first bite. I don’t know if it was because I was extremely hungry, or because they really know how to put a burger together, but either way it was fantastic. The first thing your mouth tastes is the well-cooked medium rare black angus beef, smothered in BBQ sauce. Be forewarned, this is a very messy burger. The juices didn’t hesitate when they left the burger and jumped onto the plate, drizzling all over the fries, and leaving a bbq-residue on my face and fingers. If that kind of thing bugs you… Well… You might want to find a different type of meal and blog, because burgers just aren’t you’re thing. But for me, as long as the product is tasty, I love myself a messy burger! The onion bun was phenomenal. As I’ve said before, for one reason or another, restaurants tend to cheap-out on their buns and just go with the standard. But this onion bun was covered in a-million diced grilled onions and toasted to perfection. The applewood smoked bacon was the smokiest, fattest, longest slices of bacon that I’ve seen on a burger in a long time. Ladies and gentlemen, Heroes Bar and Grill takes their bacon very seriously. But as with any meal, while swallowing, you start to lose the flavor; However as soon as the beef and bacon flavor began to dwindle, the swiss and cheddar cheeses were there when you needed them, to pick it back up. And although chef’s made what was a respectably poorly-physically-constructed burger, it could’ve easily had more stability with the use of a little attention to detail. Instead of one whole-leaf, the burger came with 3-4. That’s just too much. It made the bun fall of every single time you set the burger down. And not only for physical standards, but I do believe that too much lettuce on a BBQ burger could very-well hinder the overall taste. Whole leaf lettuce does lend itself to a great crunch, however when not regulated, the overabundance could be easily noticed in one bite. Thus, I “fixed” the burger (removed most of the lettuce), and continued to chow down. Stuffing the french fries in your mouth directly after taking a bite of a burger, grants you ability to enter nirvana; Not only complementing the burger, but standing all on their own, Heroes Famous Curly Fries are famous for a reason, as they must have been touched by the gods. Beautiful. Yet, no matter how the fries taste, I often have the complaint that when proportioned to accompany the burger with every bite, I notice that I am typically left with no fries and half a burger. But not at Heroes. The portion that was given to you, was at least 4 full-handfuls deep… Enough for one hamburger and maybe a little more. Hercules himself would have a hard time figuring out how they made the fries so delightful all the while giving you a combined sum, suitable for Zeus. 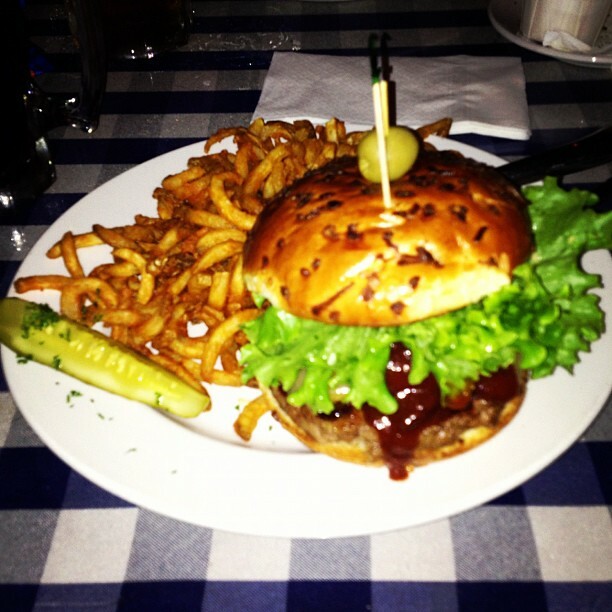 Therefore, coming in at #13 Heroes Bar and Grill’s BBQ Burger. It sits in-between #12 Umami Burger and #14 Fatburger. Till next time… BURGER UP! *Note: Actual ranking is subject to change when new burgers make the list. Also, the percentage score will not reflect the burgers’ ranking on the list, for each burger is unique and must be graded on it’s own merits. For up-to-date rankings, check THE OC Burger List in the menu! Thanks.